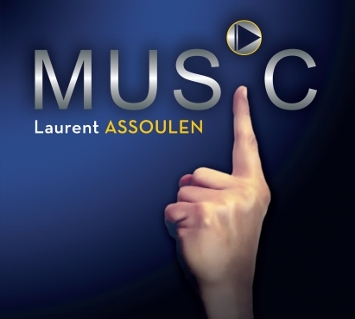 Laurent Assoulen, jazz pianist/composer, is graduated from the National Conservatory in Lyon, Classical and Jazz. He studied, in parallel, the Foreign Languages ​​( LEA ) at the University of Lyon 3 . 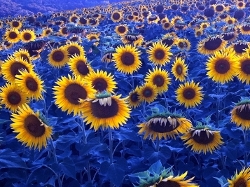 He worked several years in the creation of Fragrances, universe that he left to devote himself fully to music. 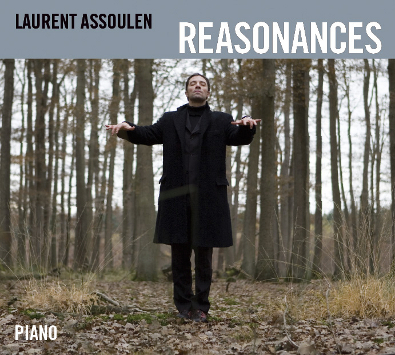 He will meet and perfect his style with several great pianists ( Kenny Baron, Bojan Z, Martial Solal, Kenny Werner... ) and release his first album in 2006 " REASONANCES " (cristal records) in solo piano. 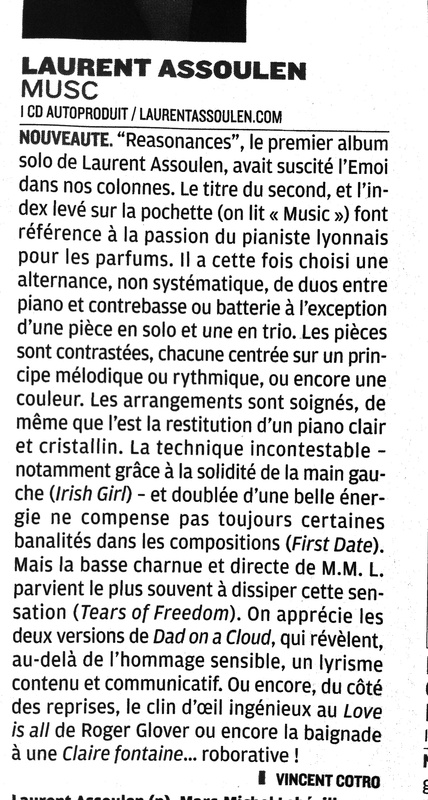 The album is warmly welcomed by the press (Disque of emotion " Jazz Magazine ", MUST "Tsf jazz Radio", …) and professionals ( FNAC Artist , MIDEM Artist ) . 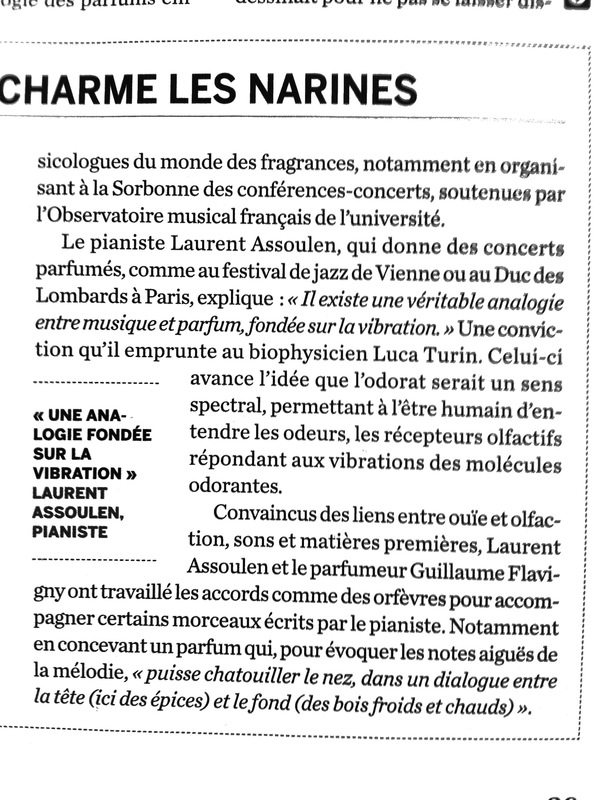 Still absorbed with his previous activity, he naturally thinks the merger of its two skills , his two passions and finally unites them after a real research on the similarities between the olfactory and sound vibrations : the « Perfumed Concert » is born. "The Perfumed Concert " in its all legitimacy is performed for the first time at « Jazz Festival in Vienna » (2008). 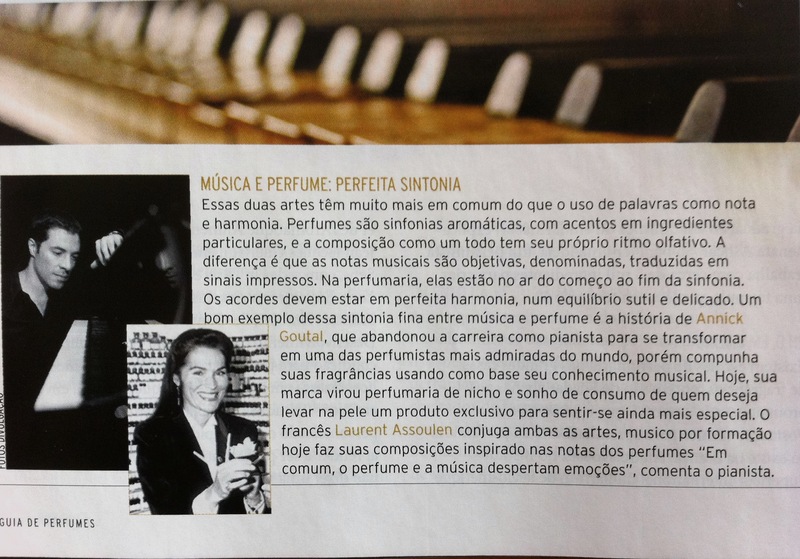 First of its kind, it is widely praised by the press which highlights an innovative, highly emotional approach, supported by the release of the album fragrant, MUSIsCent (the CD containing the 5 original scents). Concerts and conferences succeed (Théâtre du Châtelet , Paris Jazz Festival , International Perfume Museum, Duc des Lombards , etc ...) in France and abroad. 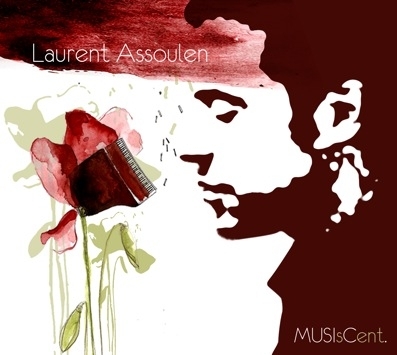 In this creative energy , Laurent Assoulen recorded his new album of duets with Marc Michel Lebévillon ( bass ) and Matthieu Chazarenc (Drums). 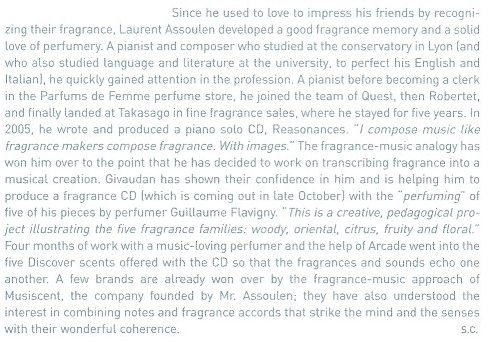 September 2011, the " terminal olfactory musical booth " is set at the International Perfume Museum in Grasse, in the context of permanent exhibitions to highlight his work. At the same time , he released his 3rd album MUSC. 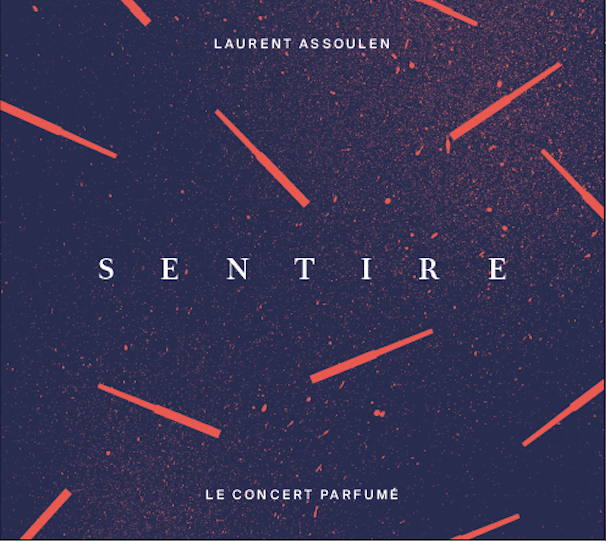 2016, « SENTIRE » is the new version of the perfumed concert, and new perfumed album, with the creative collaboration of IFF’s 3 master perfumers : Anne Flipo (Paris), Carlos Benaim (New York) and Napoleoa Bastos (Sao Paulo). It has already been presented in Brazil, Korea, Angola, Bulgaria, Luxembourg, Italy, … A new album in Trio and other international tours are expected for 2017. "Black Blank », the new album of the Jazz pianist Laurent Assoulen, carries us towards various introspective, unexpected trips, where new sounds such as the Erhu, Chinese violin, and the Kora, African harp, appear on different pieces. These instruments, rare in jazz albums, come to marry the trio creating planing, dancing and touching universes. Black Blank is a series of "complementary contrasts", punctuating life, imagining the multiple facets of emotions with humor, rhythms and delicacy"
Laurent ASSOULEN (www.laurentassoulen.com), Pianist-composer, having worked during several years in the creation of Fragrances before devoting himself completely to the music, gathers in this album, his two fields of competence, his two passions. In collaboration with Guillaume Flavigny, perfumer of Givaudan company, passioned by music, creator of these 5 Perfumes, they composed these 5 weddings. A music=its perfume. And conversely The incredible relationship between resonances of the raw materials and their sound echoes.